I am so excited because my students really understand the concept of telling time (by the hour)! I was able to make a fun center with some foam Easter pieces from the Dollar Store. I used these manipulatives in two different ways, both for telling time! 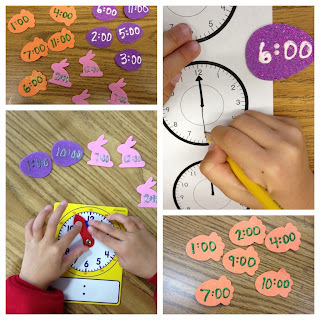 The first way we used these manipulatives to tell time was I brought out the mini clocks (some I bought at the Dollar Store and some at Lakeshore). 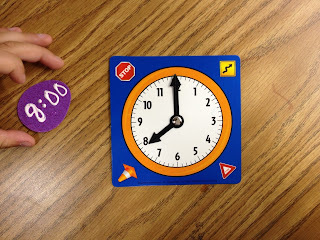 The students picked a foam piece out of a cup and they showed that time on their clock. They were able to work in partners to take turns telling each other what time to show on the clock. This was great so they could help each other if they had the wrong time. Once they showed the time on their clock they had to say the phrase: "It is ___ o'clock." This was to reinforce their math vocabulary. Girl you are workin' those Dollar Store finds!! I really like this activity. Is there a way I could find the worksheet you used?